Prebiotic foods are one of the most important things we can focus our nutrition around. 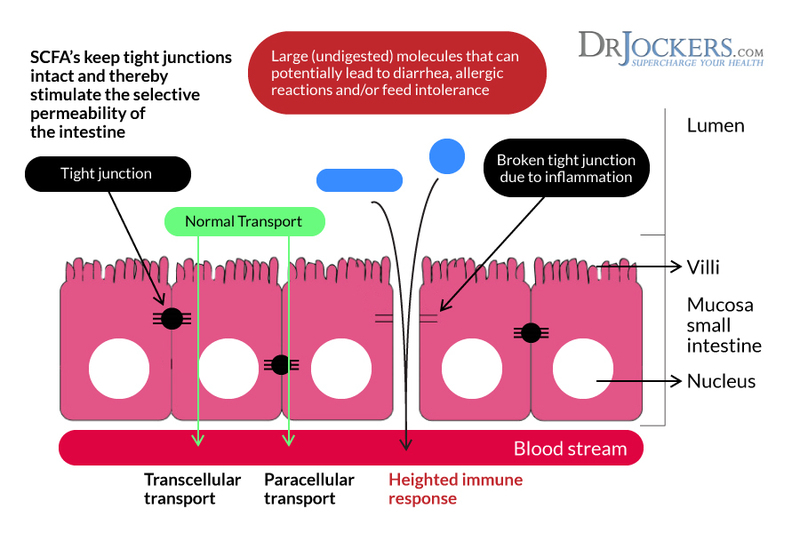 Many people today are receiving their daily dose of probiotic supplementation or at the very least understand that they probably should be. 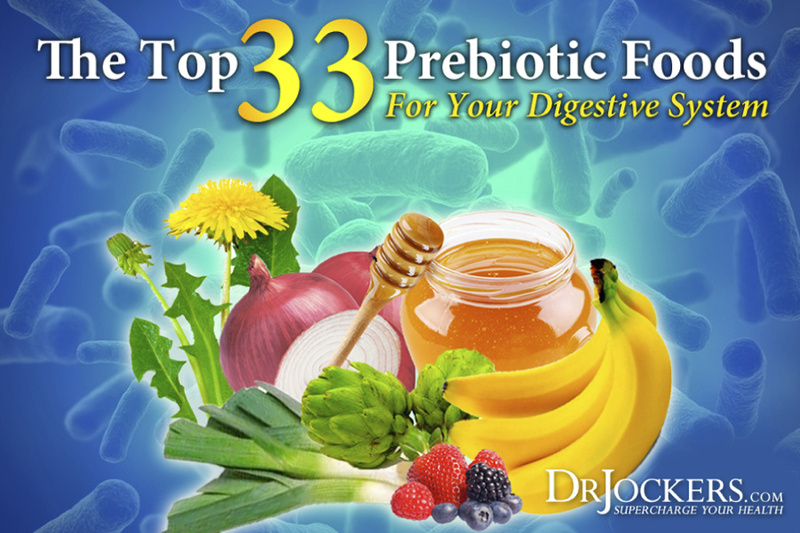 Less likely are people aware that they should also be receiving an optimal dosage of prebiotics. 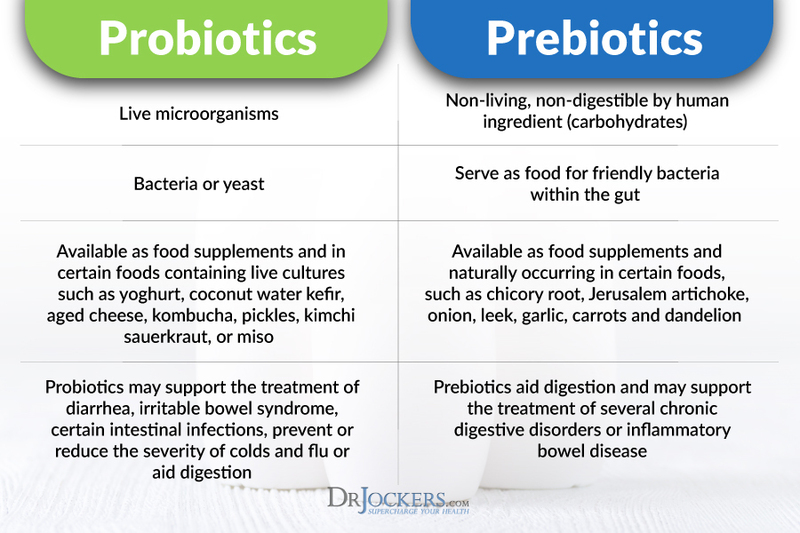 Both prebiotics and probiotics nurture the good bacteria required by the digestive tract for proper health beginning at the mouth. 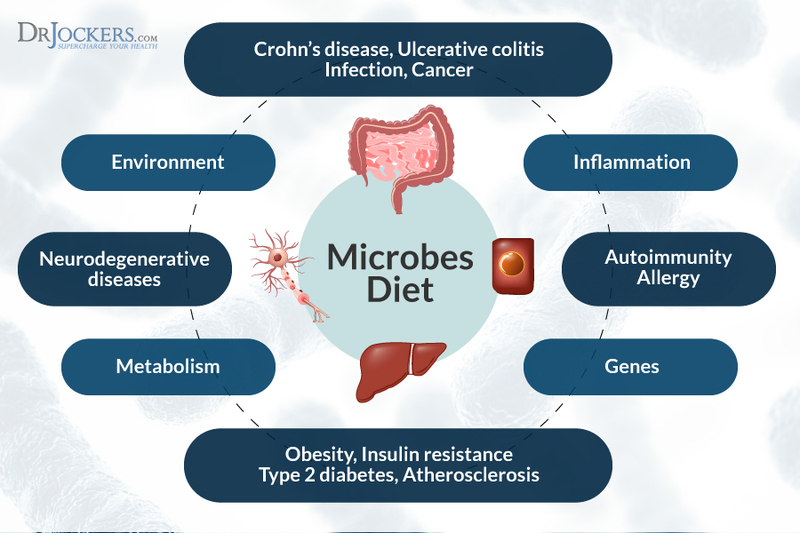 Probiotics are live, active cultures capable of multiplying in numbers whereas prebiotics serve as the food source for probiotics and do not grow or reproduce (2). One supplement that I use clinically that has both probiotics and prebiotics is SBO Probiotics. This is a soil based probiotic that contains humic and fulvic acids that help to detoxify the body while supporting the natural bacillus strains that enhance the microbial environment in our gut. 5. Digestive Enzymes: Supplementing with digestive enzymes to support healthy digestion may be helpful to you. 6. How Much PreBiotics Should I Consume? : The recommended dose for daily health and wellness is 500-1000 mg/day. Individuals with autoimmune conditions, digestive disorders and food sensitivities may benefit from increased prebiotic concentrated doses. 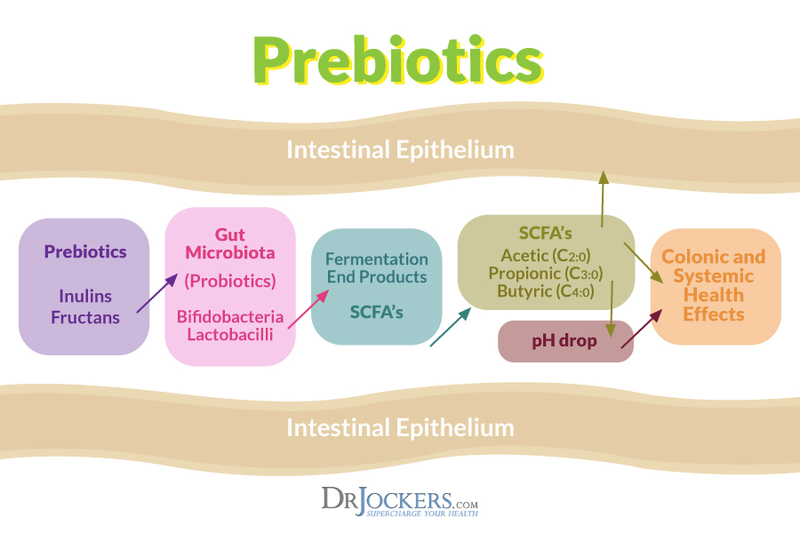 In particular, if your SCFA levels are low than added prebiotics can be especially helpful. 7. PreBiotic Supplements: If taking an oral prebiotic supplement, buy a supplement that contains either arbinoglactans or both inulin and oligosaccharides for optimal effect. 8. Great for Pregnancy: Pregnant and nursing mothers are recommended to take prebiotics because of the known benefits transferred to the baby. 10. Gut Repair Supplement: This contains compounds to help heal an irritated gut lining and nourish a healthy microbiome. I use this with most of my clients that have leaky gut and challenging digestive systems and/or auto-immune diseases. Some of these foods (like yams and wild rice) are eaten cooked. 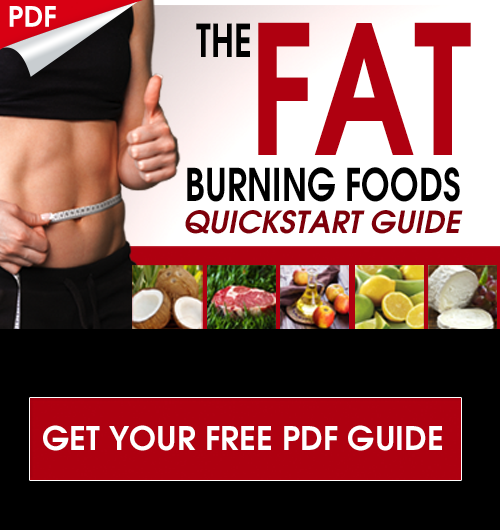 Does cooking prebiotic foods lessen their effectiveness? Hey Deane, great question and yes, these foods will still have prebiotic benefits after cooking. Even if it was cooked using cooking oil? My resident flora (bacteroides sp, bifidobacterium SP, enteroccocus SP, eschericia coli, lactobacillus SP) is very low. My virulence factors intestinal flora (katalase and urease) are to high. I have blastocystys species (which didn’t go away after taking medication clinoquiol). My gut immuno mucosa state: I have very high sIgA and beta defensine 2 values. Also I have CBS and NOS and mutatiins not favorable for the gut. Is it ok for me to take pro biotics or is it better to only take pre biotics? What can you advise My to do or what supplements to take? Dr. I’m 51 years old and have had alopecia since I’m 14. Eight years ago I read an article about two Italian boys who went gluten free and cured their alopecia. I have a first cousin who has celiac so I figured there might be some truth to the gluten explanation. One year into the diet I stopped sleeping. (The hair never came back-though a few eye lashes did appear.) I literally went 60 days without sleep. The only sleep I had came with prescription sleeping pills which only gave me the feeling of having been temporarily unconscious. The pills after a month gave me memory blanks and other horrors so I stopped. A month later I began to get a few hours a night and over time the sleep got better, but it never returned to pre gluten free days. I was at the time going through an ugly divorce, so I always assumed that that was the cause of the insomnia….Five years later I went gluten free again. And again, one year into the diet, with no warning, the severe insomnia returned. Any thoughts? Hey Gary, there could be some other issues going on including cross-reactive food sensitivities other than gluten. It is hard to say without more information. I would suggest working with one our coaches and getting some functional lab work done to get to the bottom of this. You can email michael@drjockers.com if you are interested. Hey Lin, not a huge fan of rice on a regular basis as it is high in starchy carbs, kimchi is a good probiotic for many people though! I have great faith in probiotics and and prebiotics…..I also take IP-6 to quadruple my T-Cells natural killer cells…..my questions is this….I’ve seen pure maple syrup and black tea listed as prebiotics along with the ones you list. Is that also your findings? Hey Carol, yes both of those can be considered prebiotics as well as green tea! I would steer away from doing too much maple syrup though considering the sugar content is pretty high. I was recently on four separate courses of antibiotics (amoxycillin twice and cephalexan twice) for teeth infections in the last four months! I have since developed a reaction that has left me feeling intensely feverish, weak, tired and especially ill feeling with nausea and loose bowels after meals for three weeks now. I have had blood labs, a stool sample and a chest x-ray done and all check out ok. Am I suffering a reaction from the antibiotics and how can I prevent further issues, get rid of the feverish feeling and restore my health? Thank you! 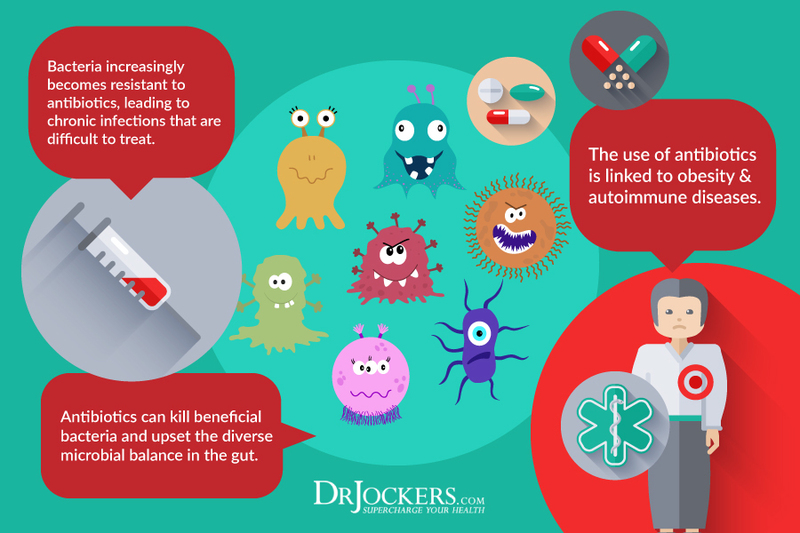 So sorry to hear about this Lin, I’d recommend reaching out to michael@drjockers.com and getting on a plan to restore your gut health as it has likely been changed quite a bit. 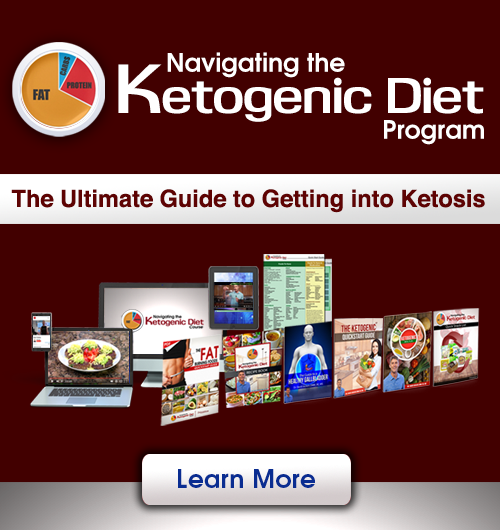 I have been suffering from gastrointestinal pain, bloating and IBS related symptoms for 15+ years. I’ve seen many doctors and been put through an insane number of tests…all of which result in no answers. I am trying the low FODMAP diet but am now worried about my healthy gut bacteria as many pre & pro biotics are eliminated. Do you have any suggestions?